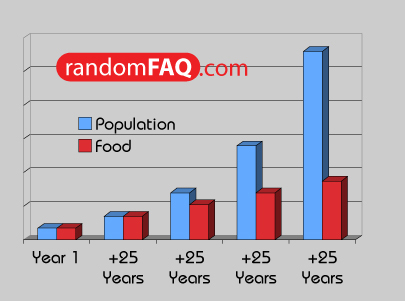 A man named Malthus predicted that as a species, humankind would outnumber food at overwhelming proportions. He calculated/predicted that population roughly doubles once every quarter century. Dealing with this seems to bring more to genetically engineered food. In the US today, genetically engineered food is common enough to be in most local supermarkets. On the other side of the spectrum and the Atlantic, Europe has outlawed the importing of genetically altered food from places such as the US. The long term effects are not completely known. On a more sadistic note, if genetically altered food kills most of the population, the levels may actually balance out again.